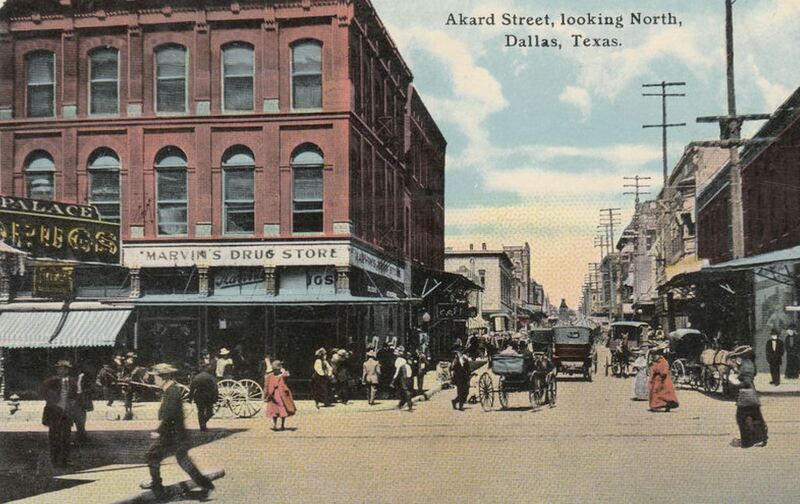 This postcard shows a bustling downtown at the intersection of Main and Akard (the view straight ahead is North Akard). Marvin’s Drug Store, on the northwest corner, was at 1415 Main, and the Palace Drug Store, on the southwest corner, was at 1414 Main. The Palace Drug Store moved to this location in December of 1909, and I’d guess the original photo used here was taken around 1910. See what this view looks like today here. 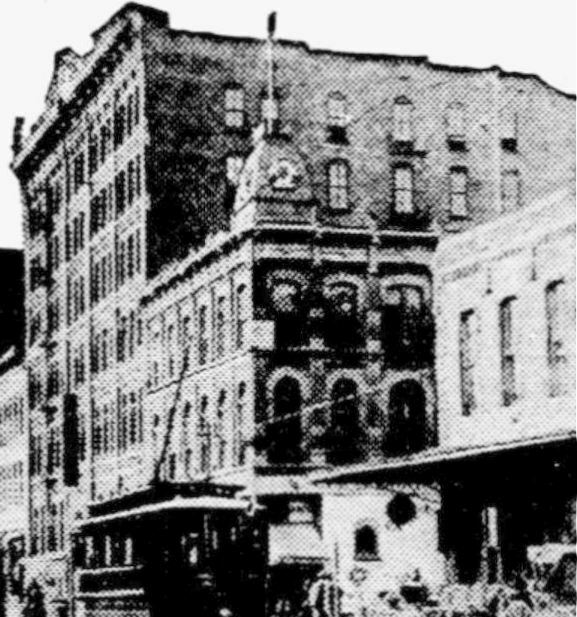 The building housing Marvin’s Drug Store was originally known as the Rowan Building, seen below in 1899 — its distinctive cupola was unceremoniously cropped from the postcard view. This attractive building was torn down in order to build the taller Marvin Building, which was originally intended to be 24 stories but was later downgraded to 16 stories, then to 10, then to 4 (but with plans to add more at a later date). When the new building opened in 1927, the namesake drugstore was retained as its ground-floor anchor tenant. This new structure was known as the Marvin Building until 1931 when the Gulf States Life Insurance Company purchased it and it became known as the Gulf States Building (coincidentally, ol’ Z. E. “Zeke” Marvin not only owned the Marvin Building and the Marvin Drug Company, but he was also the former president and CEO of the Gulf States Insurance Company). A Lang & Witchell-designed six-story addition was built in 1935. 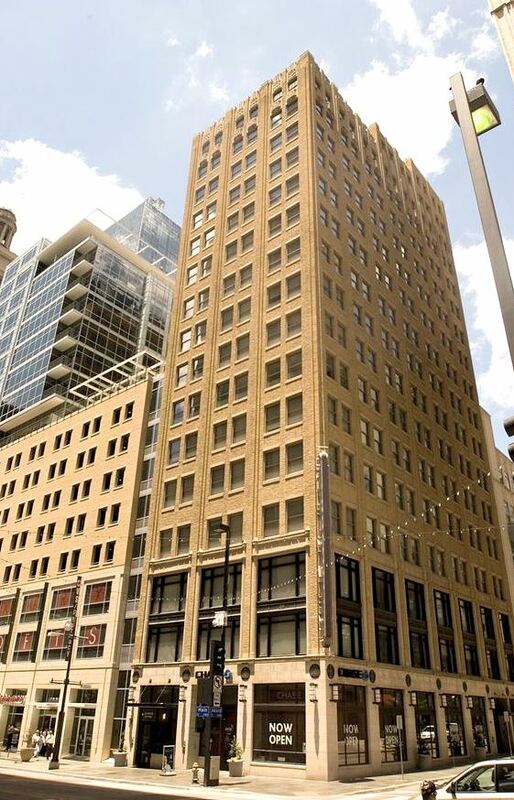 This 16-story building is still standing and has been converted into residential loft space. The postcard at the top is from the incredible Flickr collection of Christian Spencer Anderson (aka “Coltera”), here. The 1899 photo of the Rowan Building is a detail from a 1939 ad for the National City Bank of New York.